On Saturday, about two dozen students, parents and teachers came to school to learn how to program. As part of the annual Computer Science Education Week which promotes the learning of Computer Science skills including programming, ICS held what may become the first of many Beginners’ Game Code-A-Thons. Using gaming as a hook, and emphasizing fun over strict programming protocols, two three-hour workshops were held to get younger students building games using the drag & drop block programming environment of Scratch and start older students learning Java code with the easy interface of Greenfoot. The goal was to learn enough of the program to build a game. Participants were given an opportunity to explore the program and see sample games and simulations. They were then walked through the creation of a simple game, and then given time to build their own games. Turnout was not in huge numbers, but there was a decent cross-section of students and teachers from elementary school to high school. Several parent-child teams came in with both learning together and from each other. Seeing teachers become the taught was one of the many exciting aspects of the day. In the Greenfoot session, that aspect was completely on display. Adults – teachers, parents and the HS Principal – outnumbered students learning the system. 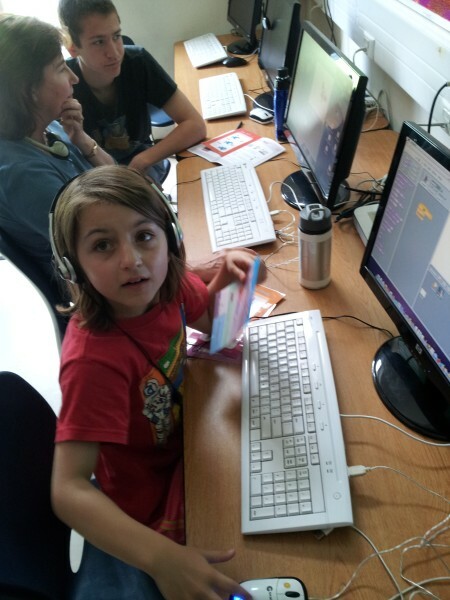 They were eager learners, with various purposes – to learn programming, to build a game, to see what the fuss was about. The leaders of the session often found it challenging dealing with the diverse group. Particularly as they were students. Josh (9th grade) and Stephan (10th grade) ran the session with minimal input from me. As they worked to explain things clearly and keep things moving at a pace that suited most if not all, showing things in front and moving around to assist their students, both boys gained new insights into learning. Josh looked over at me at one point and said simply, “Mr Iglar, teaching is hard.” I looked at the principal and suggested we do more of this kind of event. Was it worthwhile? You bet. Participants all enjoyed the sessions and expressed their appreciation of the students who led the workshops. Many were most appreciative of the fun prospect of building their own games, while a few were particularly interested in developing their ability to program in general. Will we do it again? Definitely! I have an embarrassing confession to make. I’ve never read Mindstorms by Semour Papert. I’ve known of him for decades & I’ve taught and used Logo, but I never actually read the book. I’m ashamed to admit it …but I’m making up for it now. It’s a great book: very readable, very approachable, lively in style and packed full of great ideas and content. The descriptions Papert gives of his students’ learning, and the steps he takes to help guide them to greater understanding, are excellent. It’s a beautiful description of actively engaged learners in a program geared towards helping them create meaning and understanding. What struck me very intensely from the beginning is just how appropriate it is for this day and age. It’s amazing. 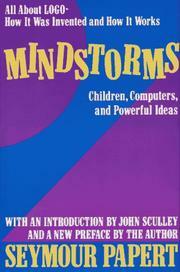 Papert wrote this book more than 30 years ago: the first edition was published in 1980. He was working with computers that have less power than the phone in my pocket. There was no world-wide web. The students weren’t collaborating with other students and classes around the world. And yet, the learning he describes is in many ways more intense and more productive than what often happens in classrooms all around the world. Papert’s students are now adults (heck, they’re only slightly younger than myself) and their children are blogging, tweeting, collaborating on web docs, contributing to wikis, etc. But their parents were reformulating problems in systematic ways to accomplish an objective. They were breaking down complex tasks into component parts. They were debugging their work when it didn’t go right. In many schools today, the phrase “computer-aided instruction” means making the computer teach the child. One might say the computer is being used to program the child. In my vision, the child programs the computer and, in doing so, both acquires a sense of mastery over a piece of the most modern and powerful technology and establishes an intimate contact with some of the deepest ideas from science, from mathematics, and from the art of intellectual model building. We teach kids how to use software to write, but not how to write software. This means they have access to the capabilities given to them by others, but not the power to determine the value-creating capabilities of these technologies for themselves. Mr. Rushkoff, meet Mr. Papert. There is plenty more that can be said about Papert and Mindstorms, but I don’t really have time right now. I have to go read the next chapter!